Moss is classified as a bryophyte, which means it does not flower and produces via spores rather than seeds or an expanding root system. Moss grows in any location that has high moisture and low sunlight levels, such as ponds, rivers, steams or shady areas of the garden. Although moss does not require fertilizer to grow, applying it to the soil in the spring helps to increase soil acid, which moss requires. 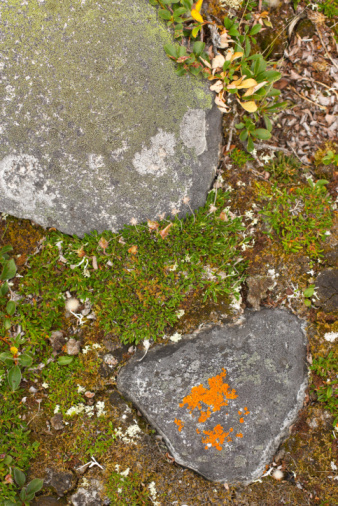 Moss gardens can be fertilized with household supplies. Locate a sprayer that is the proper size for the amount of moss you have. For small areas, such as pots, use a spray bottle. For larger areas in the landscape, use a hand-held garden sprayer. Fill the sprayer with a mixture of 7 parts lukewarm water and 1 part buttermilk or dried skim milk. Close the sprayer and shake the mixture up to combine it well. If dried milk is used, longer shaking might be necessary to ensure a thorough mixture. Direct the spray bottle or sprayer nozzle at the area of moss, holding it at least 6 inches away. Spray the moss and surrounding soil with the mixture until the ground appears wet. Wait eight to 12 hours and spray the moss again with the milk-water solution. Continue spraying the moss two times per day for two weeks.